First things first, ExtravaLANza 2017 was held at 99 Sudbury in Toronto, Canada. The venue was split into three sections, the Gallery (general public), the Glass Factory (competition and LAN space), and the Lounge (VIP Room). The Gallery consisted of the main stage, and was ultimately the place to hear about upcoming technology. All presentations and final competitions took place here, as well as the AMD tech gaming experience. This is the space where indie companies showcased their products – examples include: OddBird, who demonstrated their game Arrow Heads; StudioMDHR Entertainment Inc., who showcased Cuphead. In addition, the Gallery provided experiences from VR – like Ubisoft’s Eagle Flight – to retail companies – Canada Computers showing off their latest AMD products. The second “zone,” the Glass Factory, was for eSports competitors. Rows of tables were setup with AMD powered PCs for attendees. They also provided an open section for gamers who enjoy bringing their own rigs to such events. As we were getting ready to head over to the Gallery for the opening announcement, it was impressive to see the 4,500 square foot space rapidly fill with eager gamers, ready to compete for the top cash prizes. This brings us to the Lounge: the area where those provided with VIP passes could take a break by the bar, have snacks, mingle in a laid-back setting and dive deep into some of the latest tech. The Lounge also offered more one-on-one time with eSports pros. This is where we provided the ARAIG experience! The Lounge was our place to take people to the next level of gaming through interactive game/movie experiences. ExtravaLANza 2017 was kicked off by AMD, who gave the morning announcement. They had the crowd amped up and ready for the following days’ events. 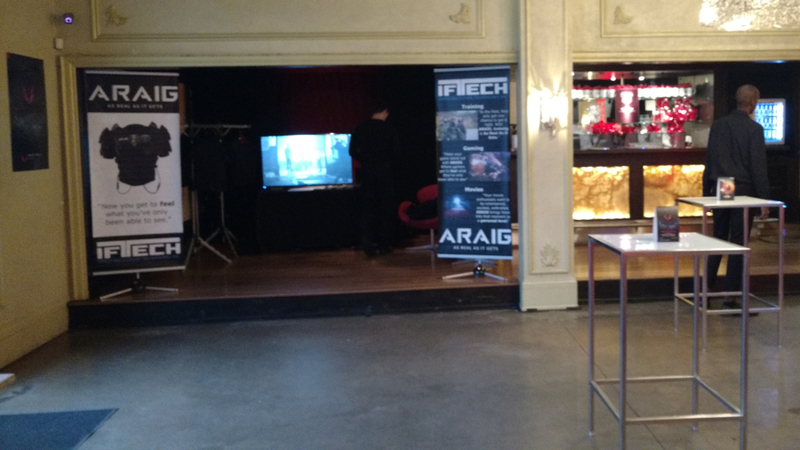 IFTech was invited onto the stage by AMD, where we were able to share the capabilities of ARAIG in gaming and movies to ExtravaLANZa’s competitors and visitors. 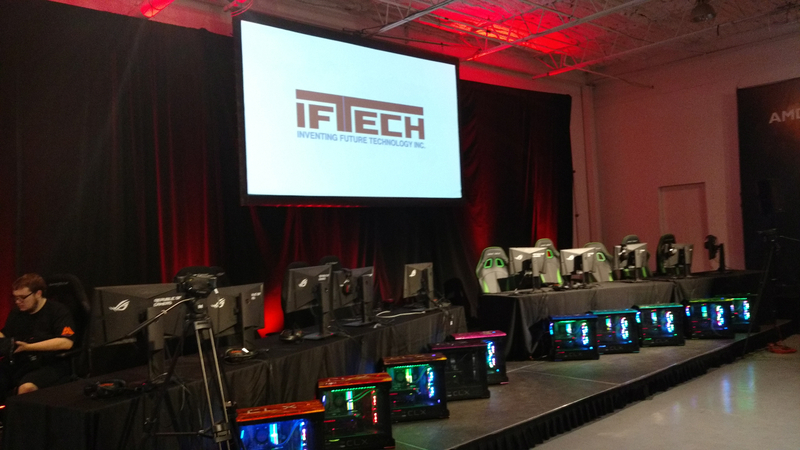 From gamers who were preparing to compete in the eSports Dota 2, CS:GO, and Super Smash Bros Wii U, to those participating in the casual LAN party play, did not hold back their excitement when learning about our technology. It was an honour to present ourselves to AMD’s gaming community, as well as share the stage with other presenters. Upon the conclusion of our presentation, we switched gears and preparedfor demos in the AMD VIP Lounge area. We shared the VIP space with several other setups, including, but not limited to, AMD’s “True Audio Next,” the chance to learn to play Smash Bros. from an eSports pro and a mini Smash Bros tournament. 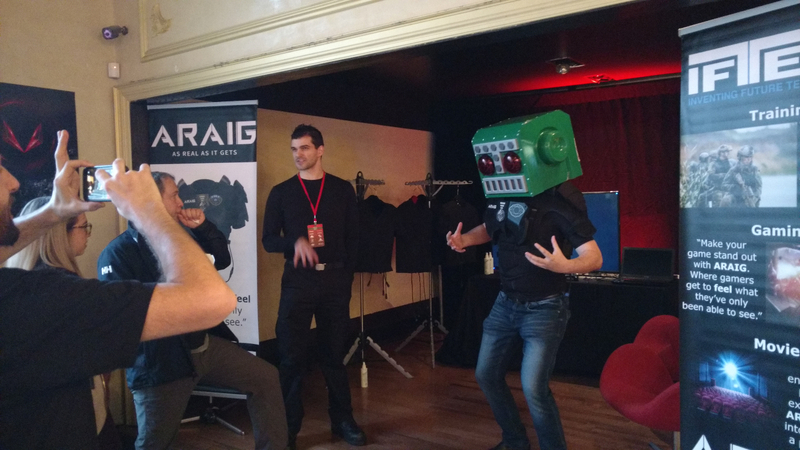 We even had the Smoking Spaceman Robot get the ARAIG experience! ExtravaLANza 2017 was enjoyed by approximately 320 gamers and 4,000 people. The diverse attendees were either directly involved in the competitions and causal play, or simply there to see what AMD and Toronto’s gaming scene are all about. For us, AMD’s ExtravaLANza 2017 was a positive first step into an eSports event experience, for not only did we share our technology, but also experienced the excitement, and what it’s like to be a part of, the larger community.